At some point in your life you will be criticised, and your reaction will determine how you deal with criticism. If it is positive, you will improve the situation; if it is negative it could lower your self-esteem and cause stress. Dealing with criticism positively is an important life skill. 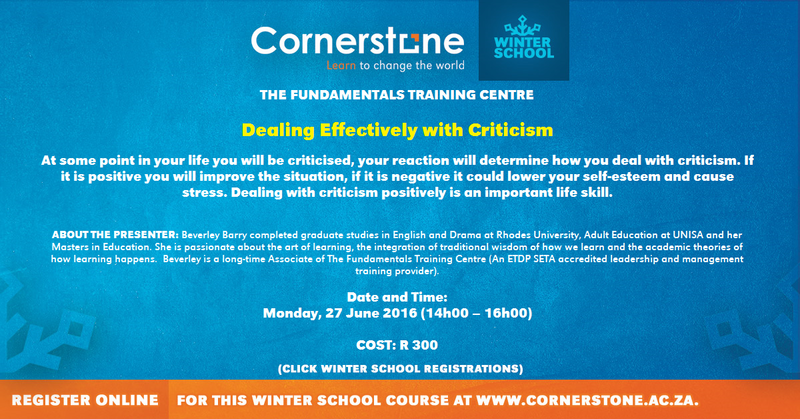 In this workshop you will understand the meaning of criticism; recognize that criticism can be constructive; identify and apply effective ways to respond to criticism, and identify plans to handle criticism more effectively in the future. About the Presenter: Beverley Barry (MA Education) is a certified Master Trainer on the International Youth Foundation’s Passport to Success. She is passionate about the art of learning, the integration of traditional wisdom of how we learn and the academic theories of how learning happens.